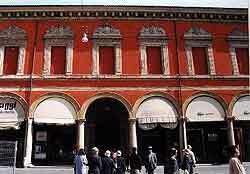 Bologna attraction-guides.com - Bologna, Italy attractions guide Bologna University Quarter, History information about attractions, bars, cafŽs, two towers, Via Zamboni, academic studies, location and address, general tourist information about University Quarter in Bologna area, Italy (Italia) IT - Last updated 30/10/2012. The University Quarter is situated in the very heart of modern Bologna and the popular University Quarter is home to a host of popular bars, cafés and other attractions. Bologna's University Quarter is a thriving district and can be found to the north-east of the two towers, along the Via Zamboni. The vast and imposing University of Bologna is actually Europe's oldest university and dates back more than 900 years. The university is an international centre for academic studies and attracts many students and visitors from all over the world.